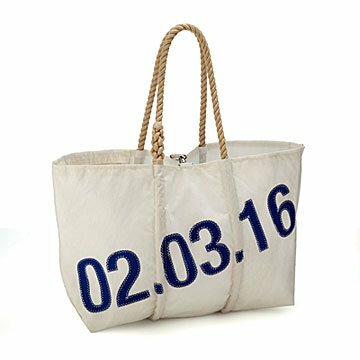 Have a special date sewn onto this tote, made from recycled sails, for a memorable gift. All at sea over which present to pick for that anniversary, wedding, or [insert other important occasion here]? It'll be smooth sailing from now on thanks to this personalized tote. Handcrafted from real sails on the working waterfront in Portland, Maine, this shoulder bag is durable, machine-washable, and, best of all, customizable. Have a special date sewn on to make it a functional keepsake for your favorite first mate(s). Topped off with an easy-to-carry rope handle. Handmade in Maine.